Pastor: Blessed be the God and Father of our Lord Jesus Christ, who has blessed us in Christ with every spiritual blessing in the heavenly places, even as he chose us in him before the foundation of the world, that we should be holy and blameless before him. Reader 2: to the praise of his glorious grace, with which he has blessed us in the Beloved. Reader 2: which he set forth in Christ as a plan for the fullness of time, to unite all things in him, things in heaven and things on earth. Reader 1: so that we who were the first to hope in Christ might be to the praise of his glory. Reader 2: In him you also, when you heard the word of truth, the gospel of your salvation, and believed in him, were sealed with the promised Holy Spirit, who is the guarantee of our inheritance until we acquire possession of it, to the praise of his glory. 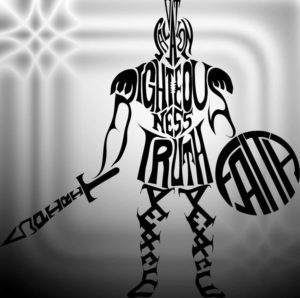 Pastor: Among the most cherished images Paul shares with us is that of the Christian clad in the Whole Armor of God. Since Paul was imprisoned when he wrote this epistle, with soldiers always at the door, he may have been drawing metaphors from the uniforms of the Romans. Their armor and weaponry were specific and appropriate to their purpose; so, too, is ours. As the uniforms of many soldiers in our history were stamped GI-government issued-so ours is GI-God issued. Paul was likely drawing also on poetic imagery from the prophet Isaiah, especially chapters 11 and 59. Pastor: And his delight shall be in the fear of the Lord. Reader 3: Finally, be strong in the Lord and in the strength of his might. Put on the whole armor of God, that you may be able to stand against the schemes of the devil. Women: against the spiritual forces of evil in the heavenly places. Women: and, as shoes for your feet, having put on the readiness given by the gospel of peace. Women: praying at all times in the Spirit, with all prayer and supplication. Reader 3: 1Behold, the Lord’s hand is not shortened, that it cannot save, or his ear dull, that it cannot hear; 2but your iniquities have made a separation between you and your God, and your sins have hidden his face from you so that he does not hear. 3For your hands are defiled with blood and your fingers with iniquity; your lips have spoken lies; your tongue mutters wickedness. 4No one enters suit justly; no one goes to law honestly; they rely on empty pleas, they speak lies, they conceive mischief and give birth to iniquity. 15Truth is lacking, and he who departs from evil makes himself a prey. The Lord saw it, and it displeased him that there was no justice.16He saw that there was no man, and wondered that there was no one to intercede; then his own arm brought him salvation, and his righteousness upheld him. 17He put on righteousness as a breastplate, and a helmet of salvation on his head; he put on garments of vengeance for clothing, and wrapped himself in zeal as a cloak. Pastor: Look carefully then how you walk, not as unwise but as wise, making the best use of the time, because the days are evil. Therefore do not be foolish, but understand what the will of the Lord is. And do not get drunk with wine, for that is debauchery, but be filled with the Spirit, addressing one another in psalms and hymns and spiritual songs, singing and making melody to the Lord with all your heart, giving thanks always and for everything to God the Father in the name of our Lord Jesus Christ, submitting to one another out of reverence for Christ.